Idyllic in landscape, rustic in character, the Gulf Islands bask in a mild climate and pastoral tranquility. Almost 200 islands of all shapes and sizes lie tucked against the southeastern shore of Vancouver Island with only the invisible international boundary dividing them from the San Juan Islands in US waters. Saltspring Island is the largest island with an official measurement of 182.7 square kilometers (70.5 sq mi) with about 10,500 permanent residents (2008 census). The largest village on the island is Ganges. Saltspring is often referred to as an "artists paradise". It is home not only to many reputable artists but to a variety of galleries and craft studios. Boating is a popular pastime of locals and visitors alike and the island provides many harbours and moorings. Other water activities include swimming, wind surfing, fishing, sailing, kayaking and canoeing. Inland, there are many roads and trails to lure the hiker or biker. Pender Island is approximately 34 km2 (13.1 sq mi) in area and is home to about 2,500 permanent residents, as well as a large seasonal population. The sub-mediterranean-type climate (781mm/31inchs of rain per year) makes North Pender Island and South Pender Island perfect for family vacations including boating, hiking and nature watching. The Pender Islands are known as the "friendly islands" and "islands of hidden coves and beaches", boasting 20 public ocean access points with swimming and picnic sites. Many visitors like to bike or hike the country lanes and trails, exploring this fascinating island. Boating is also popular; the accompanying water activities are also a draw for visitors - diving, fishing, wildlife watching, canoeing and kayaking. Pender Island is a popular destination for other outdoor pursuits. The island also boasts a 9-hole golf course. 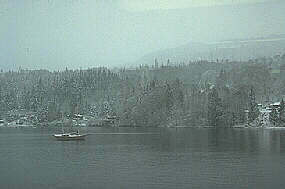 Mayne Island is a rustic 21km island in the southern Gulf Islands chain of British Columbia. It is situated midway between the Lower Mainland of BC and Vancouver Island, and has a population of around eleven hundred. Named after a lieutenant Richard Mayne of the Royal Navy, Mayne Island is a quiet island with a colourful past. During the Fraser River/Cariboo Gold Rush of the mid 1800's, Vancouver Island miners gathered at Miners Bay before crossing to the mainland. The site is still a draw for history buffs. Wander through the many studios and galleries on Mayne Island or hike, bike, swim or just explore - what better way to spend an idyllic summers day. 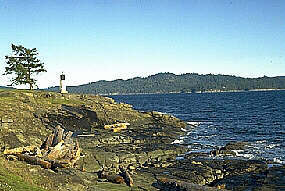 Galiano Island is 27.5 km long, 6 km at its widest point, and 1.6 km across at its narrowest point. The island is northwest of Mayne Island, northeast of Saltspring Island and southeast of Valdes Island and has a population of 1258 inhabitants. Galiano Island is an ideal recreation destination with miles of old logging trails and country lanes for walking, mountain biking or horseback riding. On the western side of the island there are a series of sandstone caves. The many parks on Galiano Island, like Belhouse Park or Dionisio Point Provincial Park on Porlier Pass, provide the outdoor enthusiast with endless hiking possibilities plus spectacular scenery. Sail, kayak or fish the local waters. Saturna Island is a mountainous island, about 31 sq km in size. The southern-most of the Gulf Islands chain, Saturna is situated approximately midway between the Lower Mainland of BC and Vancouver Island, and is the most easterly of the Gulf Islands. Saturna has a permanent population of around 350, although that number increases significantly during the busy summer season. Saturna Island is a very special place to visit. Fairly large in area, Saturna Island boasts an easy-going pace that makes it a perfect get-away spot. Mt. Warburon Pike offers sights of feral goats on the ecological reserve at the top. Cycling along East Point Road will offer you views across to the mainland mountains. Approximately half of the island is in the Gulf Islands National Park Reserve that was formed in 2003 from 2 provincial parks, an Ecological Reserve, and other Crown land. The Gulf Islands National Park Reserve maintains numerous hiking and walking trails, campsites and moorage sites in the Gulf Islands. On their website you can learn about opportunities in GINPR for boating, kayaking, hiking, wildlife viewing, and picnicking. As well, learn about the fun activities being held in GINPR, like Interpretive Program activities throughout the park (from June until early September). Be sure to download their free brochure with a map of hiking and camping opportunities. Access: The BC Gulf Islands are all accessed by the BC Ferries system from Vancouver Island and the mainland. There is local air transport available as well as small boats. Recreation Activities: Water activities are popular on all the islands; kayaking, canoeing, diving, fishing, swimming. Hiking and biking the roads and trails are also a popular pastime. Saltspring and Galiano Islands have golf courses. Accommodations: There are a variety of accommodations on the islands, from hotels/motels to lodges and bed & breakfasts. All the islands but Saturna Island have campsites.